Its a GREAT OPPORTUNITY to Earn EXTRA CASH per month !! 1. There is no enrollment fee for joining Oriflame in Noida, You can order cosmetics @ 20% discount and start making savings and commissions for the first order itself! 4. Work as many hours a week as you want, depending on your goals! 5. You can advance quickly and become MANAGER in 3 months by learning from me. 6. Every month a new Oriflame catalogue with super promotions will be launched. From January to December there is non stop shopping in Oriflame. 7. Training, support and assistance is available from my side. I will join you in my whatsapp group once you place your first order. There you will learn everything about the Oriflame business. 8. 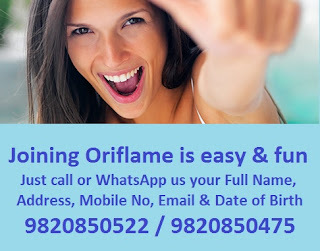 You can get your Oriflame beauty products in Noida at your home because they are delivered to you only by courier. 9. Easily and quickly you can develop a team by recruiting others under you. You can join Oriflame consultants in Delhi, Gurgaon, Gaziabad, etc in your team. The bigger your team, the more you will earn. 10 There is no Oriflame store in Greater Noida. You can not open a Oriflame shop in Noida as the company will not allow it. But you can open a Oriflame service point in Noida once you become a Manager. If you are interested in that just call me and I will guide you. For joining Oriflame you can click here to fill the Oriflame Online Registration form or send us an email on jashmiw@gmail.com with your Name, Address, Mobile No, Email id and Date of Birth.